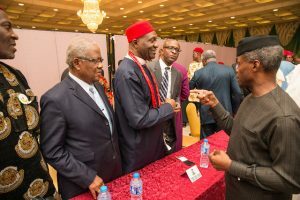 The Indigenous People of Biafra (IPOB), on Thursday, condemned the meeting of Igbo landers with the Acting President Yemi Osinbajo, describing it as ‘a gathering as a few compromised political jobbers from core Igbo states of Biafraland’. IPOB noted that its leader, Nnamdi Kanu, has made it abundantly clear that any discussion or dialogue with the Nigerian Government that did not include an agreement on a referendum date to determine the issue of Biafra would be considered an exercise in futility. Media and Publicity Secretary of IPOB, Emma Powerful, in a statement, said that IPOB viewed the meeting with certain Igbo politicians who were sympathetic to APC as an insult to the sensibilities of Biafrans all over the world, especially the memory of the dead and injured. The statement read in part: “This meeting we understand was convened at the instigation of the Nigerian Acting President Professor Yemi Osinbajo following the political fallout from the hugely successful IPOB sit-at-home order of 30th of May 2017”. “With one or two exceptions and with the greatest respect to the attendees to this Nigeria sponsored gathering in Abuja, the so-called South-East delegation is in no way representative of the views of the leadership of IPOB worldwide, neither can they claim with any degree of sincerity to be speaking for the masses”. “Therefore all Osinbajo has succeeded in achieving with this meeting is to waste scarce resources that could have been channelled towards more useful purposes. None of those that attended this meeting with Osinbajo gave the order for people to sit-at-home on May 30th. So we are at a loss to understand the justification for their invitation to the meeting to discuss something they know nothing about”. “In this regard, we wish to inform the government of Nigeria that the gathering and deliberations they thought they had yesterday is a complete waste of time and will continue to be until the Federal Government does the needful. We note and respect the presence of Chief Nnia Nwodo the Ohaneze Leader and two others at that very meeting, however the rest are nothing to write home about”. “We do not think that presiding over the distribution of monthly allocation from Abuja qualifies any political office holder to discuss issues pertaining to IPOB and Biafra restoration when the leadership can be directly contacted”. “Since August 2015 that Nigerian Government and her security operatives, especially the Army, Navy, DSS and Police, have been killing and abducting innocent and peaceful IPOB members, none of the governors that attended this meeting in Abuja rose to condemn the brutal and barbaric repression of IPOB peaceful agitation for a independent homeland for Biafrans”. “None of them offered any comment in condemnation of the well documented atrocities despite the existence of overwhelming evidence to substantiate the facts alluded to in the widely received Amnesty Report on the senseless slaughter of IPOB members. How can such persons now go to Abuja to discuss issues bothering on the activities of IPOB when they know nothing about the modus operandi of the organisation. Only IPOB can and will discuss issues pertaining to her activities, not compromised politicians”. “From time, we firmly resolved that nobody among the governors or politicians can set an agenda for IPOB except our leader Mazi Nnamdi Kanu. The sooner Nigerian Government understands this, the better. Therefore, any meeting without the consent of our leader or those nominated by him in a representative capacity, is a complete waste and unacceptable to IPOB” powerful stated,” it said. But come to think about it, how does the Acting President think that meeting or dialoguing with this crop of people will assuage, mitigate or derail the agitation in the East purely being carried on by IPOB. i don't think that will solve the problem.